Dr. Juming Tang is finding new ways to make our food safer. 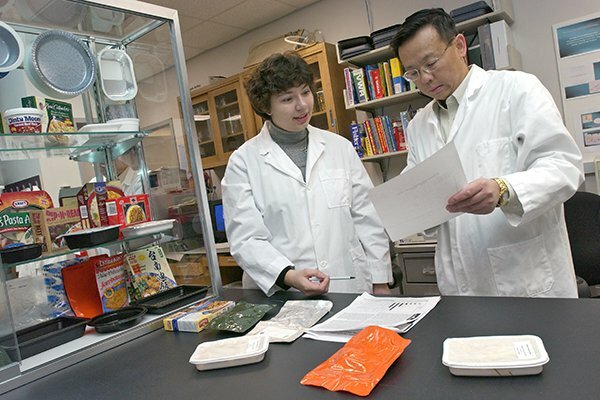 The Regents Professor and Distinguished Chair of Food Engineering has developed new methods of controlling bacteria and viruses in “ready-to-eat meals”— frozen, refrigerated, or shelf-stable entrees sold at retail markets and used in institutions, as well as shelf-stable rations fed to military personnel in the field. His microwave-assisted thermal processing technologies could revolutionize food preservation and packaging. Dr. Tang preserves foods faster and at lower temperatures than traditional canning methods using 915 MHz Single-mode Microwave Assisted Sterilization (MATS) and Pasteurization (MAP) processes. Food retains more nutritional value, flavor, and texture—naturally. There’s no need for the extra salt, additives, and flavor enhancers currently used to make ready-to-eat meals palatable. What’s more, dangerous pathogens don’t stand a chance. The technologies not only have advantages for consumers, but for food processing companies as well. Industrial systems based on the technologies will be fully automated. They will reduce energy and water use. Because they are less noisy than existing food processing systems and do not emit steam into the work space, they will create a more hospitable work environment. The benefits of MATS and MAP food preservation methods are clear to world-leading food processing and packaging companies, who are partnering with Dr. Tang to bring the technologies to market. Dr. Tang also works jointly with research institutions affiliated with the U.S. Department of Defense and the Australian Government Department of Defence, as well as the NASA Johnson Space Center Food Laboratory. His patents have led to the formation of 915 Labs, a company that works to spread adoption of the new food-preservation technologies worldwide. Dr. Tang’s research has received support of private companies and numerous federal agencies, among them the Department of Defense, the Department of Energy, and the U.S. Department of Agriculture National Institute of Food and Agriculture.